Inherent Beauty Reviews: Does This Product Really Vanish Wrinkles? Inherent Beauty Reviews: Does It Really Repair The Skin Damage? The company behind Inherent Beauty is Beauty Labs. There is no other information available about the track record or experience of this company in formulating anti-aging skin care products. Inherent Beauty must be used as part of your day time and night time routines for best results. Always perform a patch test when trying out new anti-aging products for the first time to check for any sensitivity you may have towards anti-aging ingredients that can be highly irritating most especially when used on sensitive skin types. 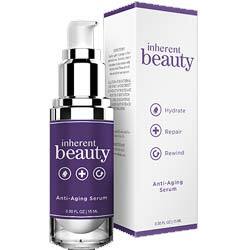 Inherent Beauty reviews that promote product use attest to this product being an effective anti-aging cream, except these are posted on affiliate marketing websites. The lack of information available about this product and its manufacturer, including the absence of an official product or manufacturer website, seriously makes available information about these two doubtful and highly unreliable, not only because there is no way to validate data but also because third party websites provide different information, including differing list of ingredients. This product is very expensive at US $90 per bottle given the lack of credible information. Inherent Beauty reviews poster by users highlight how this company has taken advantage of users’ credit card information, charging users’ accounts with the full product price with a recurrent monthly charge which, allegedly, is due to the user’s auto-enrollment in the product’s auto-ship program as stated in the Terms and Conditions of the free trial.